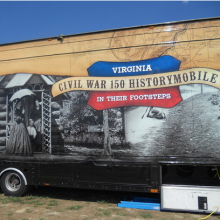 Stepping into the HistoryMobile offers much more than a reprieve from the humid fairgrounds – it transports viewers to a tumultuous time in Virginia’s past, and reminds residents about how their state endured the Civil War. The initial room sets the scene, as a wavering voice comes on the loud speaker, and is quickly followed by gunshots. The speaker is reading an actual letter a Civil War soldier wrote in his final minutes. Fairgoers who checked out the HistoryMobile this week called that room an instant favorite. “The gunshots put you right in the middle of it,” said Michael Flack, adding that he liked how the trailer was interactive. “Kids would really enjoy it,” said Stephanie Mordensky. “It wasn’t just the soldiers who were affected,” he said. Much of the HistoryMobile is devoted to telling the lesser-known tales of the Civil War in Virginia – like Bill Ross’ favorite story about Jack the dog. As the driver of the HistoryMobile, Ross challenges viewers to find the dog as they navigate through the trailer. Jack, like many of his fellow Civil War soldiers, had a rough time on the front lines. Originally adopted by a firehouse in Pennsylvania, Jack the bulldog joined the 102nd Pennsylvania Volunteer Infantry in 1861, was injured during the Battle of Malvern Hill in 1862 and was later captured and released through a prisoner exchange 1863. Besides Jack’s unusual story, Ross said he was shocked to learn that about 1.5 million horses perished during the Civil War. “That’s like a small city,” he said. Mordensky said she was surprised to learn about the culinary aspect of life during the war. As part of one HistoryMobile exhibit, viewers have to guess what items are used to cook things like pie crust and coffee. Apparently, acorns can substitute for coffee grounds in a pinch. With interesting and largely unknown factoids, the HistoryMobile is a must-see. The trailer will be parked at the Arlington County Fair until Sunday. Admission is free. The Attractions Are Here, Now Where Are Those Tourists?